Enter The Twilight Zone via 2019 Rittenhouse Twilight Zone Rod Serling Edition trading cards. Created by Serling, the spooky CBS television series began in 1959. 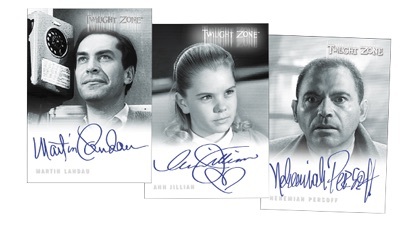 Rittenhouse Archives has previously released several different card sets for the franchise, with the last being 2009's The Complete Twilight Zone. In addition to the comprehensive base set and multiple inserts, every Hobby box contains two autographs with a shot at a limited Rod Serling cut signature card. Covering all the episodes from the original series (1959 to 1964), the 156-card base set showcases Serling's opening and closing monologue. According to Rittenhouse, it is "the most expansive and authoritative Twilight Zone card set produced to date!" There are also several insert sets to compile, including Portfolio Prints - The Serling Episodes featuring Juan Ortiz art for the 92 episodes that Rod Serling either wrote or adapted. Ortiz also supplied the artwork for the nine-card Character Art Portfolio Prints set. Other options include Mirror/Mirror (9 cards), Stars of the Twilight Zone expansions (18 cards), and the six-card Rod Serling's Opening Monologue. 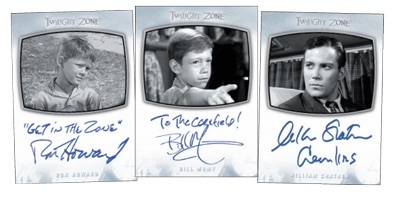 The 2019 Rittenhouse Twilight Zone checklist is also likely to see some attention based on the autograph signers, with many being first-timers for the franchise. Key names include Cloris Leachman, Martin Landau, Ron Howard and William Shatner. The selection consists of the main Autograph line utilizing black-and-white images. Averaging three per case are the Inscription Autograph cards with a unique addition alongside the signature. 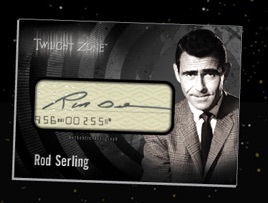 Although Serling died in 1975, collectors can chase one of 50 numbered Rod Serling Cut Signature cards. Finally, the Dual Autograph for Cloris Leachman as Mrs. Fremont and Bill Mumy as Anthony Fremont is a nine-case incentive, and those buying 18 cases get the Archive Box that has three different printing plate sets with four cards each. TWILIGHT ZONE AUTOGRAPH CARD A-20 WILLIAM SHATNER AS DON CARTER 4 SCREW FREE SH!